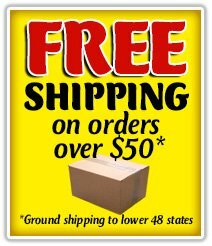 POWER SOURCE Batteries by LVP Distribution 12 volt Sealed AGM Gel Maintenance-Free oem batteries for motorcycle, atv quad, scooter, utility vehicle side x side UTV, jet ski personal watercraft pwc, snowmobile and big bore V-twin bikes﻿. 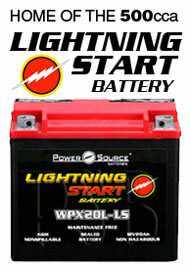 Lightning Start 500 cold cranking amp 20ah and 600 cca 30ah ultra high performance batteries with more starting power. WPX4L-BS, WP4B-BS, WP5L-BS, WP7A-BS, WP7L-BS, WP7B-4, WPZ7S, WP9-BS, WP9B-4, WPZ10S, WP12A-BS, WP12-BS, WP12B-4, WPZ12S, WP14B-4, WPZ14S, WP14-BS, WP14L-2, WPX14AH-BS, WPH14L-BS, WPH16-A2, WPH16-BS-1, WP16CL-BS, WPX20L-BS, WPX20L-LS 20ah 500cca Lightning Start, WPX20-BS, WPX15L-BS, WP20-12i, WP50-N18L-A, WP50-N18L-A3, WPX30L-BS, WPX30CL-BS, WPX30L-LS 30ah 600cca Lightning Start, WPX30CL-LS, WPX20CH-BS 18ah 370cca. Replacement for Yuasa, Power Sonic, Adventure Power, BikeMaster, Bikers Choice, CarQuest, Deka, Drag Specialties, GS, Interstate Cycle-Tron, Leoch, Motocross, Napa Power Sport, Super Start, Parts Unlimited, Power Max, Scorpion, Sears Diehard, Twin Power, WestCo, WPS, Xtreme, Polaris, Ski Doo. Full 1 year warranty.